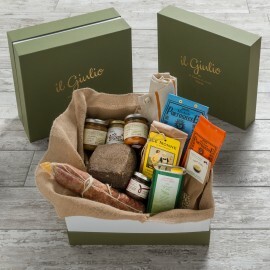 Tuscan food breakfast box, the most romantic and original awakening ever. Live the “dolce vita” and get a light, complete, greedy, energizing breakfast, made only of traditional Tuscan food specialties. The most sensual way to start your day, just like you’re actually living inside a 5-star hotel. Open the Breakfast box: the genuine flavors, the typical specialties, the high quality of the made in Italy food will bring you immediately in an exclusive setting, "on the grass", in the open air. Just as the true luxury often resides in authenticity, natural aromas are definitely the most original and surprising. Do you remember the taste of homemade jams? In the Florentine countryside each plant is cultivated with strong care and passion, the fruits selected and harvested with love, people share their life and experiences with the trees. If you want to fell and understand this emotion, you have only to try to spread a slice of bread with a peach, strawberry or pear jam (Fattoria Arcetri), may be accompanying it with the apricot juice. The French Honeysuckle Honey and that of Chestnut (Az Giovanni Villani) reveal a golden appearance as the first light of the morning, while the lovers of the milk will fall in love with the biscuits of the Nonne di San Frediano (Dolce Emporio), crunchy bites of happyness, prepared following ancient family recipes, recalling a past era, when everything was handmade, virtuous and sustainable. 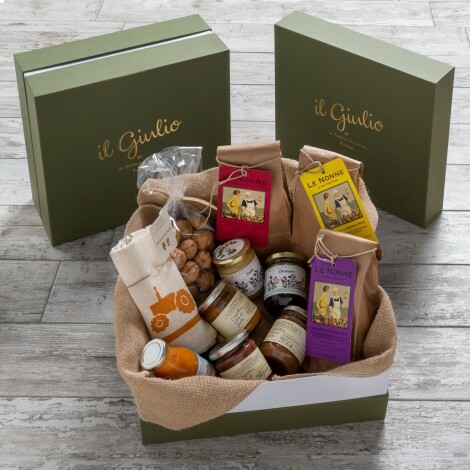 Discover the Tuscan food in your special box, but beware, you may fall in love with it! It is a small treasure box of pleasure, a little masterpiece of art, revealing "an artist soul, here, and if you are not an artist you can not appreciate it, because it is a fact of ... fantasy". If you are a lover of Tuscan food, you will absolutely appreciate the Old Florence box, which contains the most enticing traditional Tuscan food, the best specialties recalling your memories to your recent holidays in Florence. The excellence of the Tuscan food in a “Starred box”, the box enclosing the precious essence of the traditional specialties of Tuscany. A collection of gourmet delicacies, a perfect “wiki” of the best traditional Tuscan food, a narration of taste perfectly defining the Italian culinary culture. Order and get ready to taste the best Tuscan food: Country box, the marvelous and gourmet box, a refined selection of the top traditional Tuscan food, enjoy the fantastic savor of our specialties! All the ingredients you will find inside the Country box are cultivated in the Florentine area, in the worldwide famous countryside.